One aspect of the S&P 500 Index return in 2017 is the fact a handful of stocks have generated a large portion of the return. Historical evidence suggests narrow market leadership is not an uncommon occurrence in bull markets. Interesting this year, however, is the fact this leadership has been centered in technology stocks. 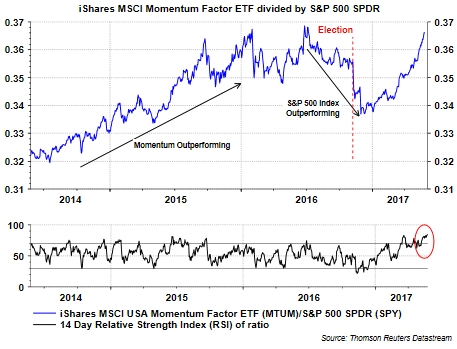 I discussed this in a post a few weeks ago when I looked at detail surrounding the Momentum Index (MTUM) strategy performance and its similarity to 2015. At the time of the prior post, the RSI of MTUM versus the S&P 500 Index was below 80. In the last few weeks though, the relative strength index (RSI) has pushed above the overbought level of 80, actually reaching above 85. 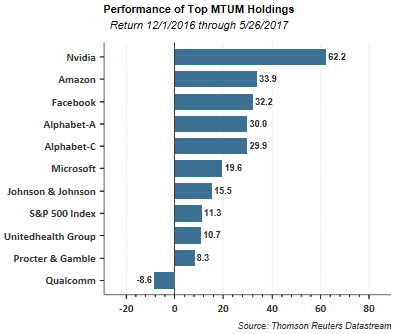 As the below graph shows, the top ten holdings of the iShares MSCI Momentum Factor ETF (MTUM) is comprised largely of technology stocks. The weighting of these top 10 positions equals nearly 40% of the overall index itself. The performance begins at the first of December, the time when momentum began its outperformance. In spite of the fact the momentum strategy may continue to lead in 2017, the leadership does not produce higher returns in a straight line. Given the overbought level of the RSI and the strength of the move since December, a near term pullback in these larger technology positions, and the momentum strategy itself, would not be a surprise.